Note: this taxon list is still under construction. It does not yet contain all known Hybosoridae subgroups. Grebennikov, V. V, A. Ballerio, F. C. Ocampo, and C. H. Scholtz. 2004. Larvae of Ceratocanthidae and Hybosoridae (Coleoptera: Scarabaeoidea): study of morphology, phylogenetic analysis and evidence of paraphyly of Hybosoridae. Systematic Entomology 29:524-543. Jameson, M. L. 2002. Hybosoridae Erichson 1847. Chapter 31 in American Beetles. Volume 2. R. H. Arnett, M. C. Thomas, P. E. Skelley, and J. H. Frank, eds., CRC Press, Boca Raton, 861 pp. Ocampo, F. C. 2002. Hybosorids of the United States and expanding distribution of the introduced species Hybosorus illigeri (Coleoptera: Scarabaeoidea: Hybosoridae). Annals of the Entomological Society of America 95(3):316-322. Ocampo, F. C. 2003. A new genus and two new species of Hybosoridae (Coleoptera: Scarabaeoidea) from Costa Rica, Panama, and Colombia. Canadian Entomologist 135:41-52. Ocampo, F. C. 2006. Phylogenetic analysis of the scarab family Hybosoridae and monographic revision of the New World subfamily Anaidinae (Coleoptera: Scarabaeoidea). 1. 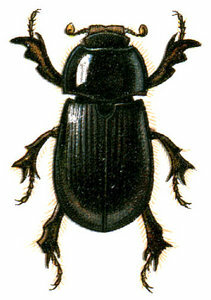 Introduction to the scarab family Hybosoridae (Coleoptera: Scarabaeoidea). Bulletin of the University of Nebraska State Museum 19:3-6. Ocampo, F. C. 2006. Phylogenetic analysis of the scarab family Hybosoridae and monographic revision of the New World subfamily Anaidinae (Coleoptera: Scarabaeoidea). 3. Phylogenetic analysis of the subfamily Anaidinae (Coleoptera: Scarabaeoidea). Bulletin of the University of Nebraska State Museum 19:13-177. Ocampo, F. C. and A. Ballerio. 2006. Phylogenetic analysis of the scarab family Hybosoridae and monographic revision of the New World subfamily Anaidinae (Coleoptera: Scarabaeoidea). 4. Catalog of the subfamilies Anaidinae, Ceratocanthinae, Hybosorinae, Liparochrinae, and Pachyplectrinae (Scarabaeoidea: Hybosoridae). Bulletin of the University of Nebraska State Museum 19:178-209. Ocampo, F. C. and D. C. Hawks. 2006. Phylogenetic analysis of the scarab family Hybosoridae and monographic revision of the New World subfamily Anaidinae (Coleoptera: Scarabaeoidea). 2. Molecular phylogenetics and systematic placement of the family Hybosoridae (Coleoptera: Scarabaeoidea). Bulletin of the University of Nebraska State Museum 19:7-12. Ratcliffe, B. C. and F. C. Ocampo. 2001. Tyrranosorus rex Ratcliffe and Ocampo, a new genus and species of Miocene hybosorid in amber from the Dominican Republic (Coleoptera: Scarabaeoidea: Hybosoridae). Coleopterists Bulletin 55(3):351-355. Jacobson, G. G. 1905-1915. The Beetles of Russia, West Europe and Adjacent Countries. A. F. Devrien, St. Petersburg.